The Nine-Fold Scarf ( 九樑巾 Jiuliang Jin ) is a kind of hat usually worn by Daoists. It has a lean top like the lean roof of Chinese tiled houses. The front has nine folds and nine beams. It is similar to the Chunyang Scarf ( 重陽巾 Chongyang Jin ) or the Nine-Fold Huayang Scarf ( 九轉華陽巾 Jiuzhuan Huayang Jin ). The Chart of Three Rites ( 《三禮圖》Sanli Tu ) says, "The Chunyang Scarf, also named the Letian Scarf, is rather similar to the scarves of the Han and Tang Dynasties. Its top has an inch of silk folded like bamboo tablets hanging in the back. 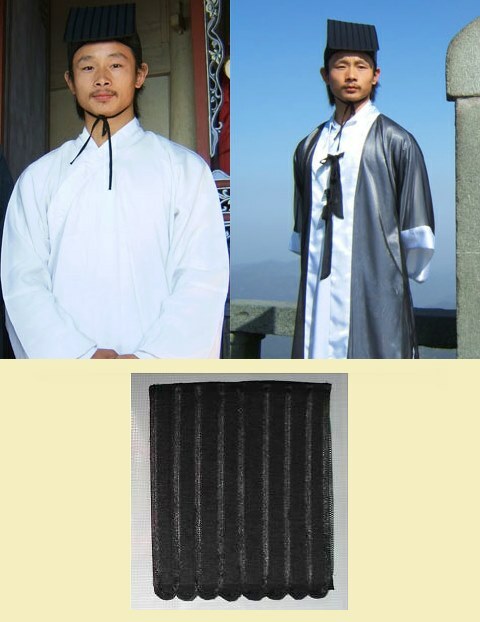 It is called the Chunyang Scarf after the immortal Lu Chunyang and the Letian Scarf after the poet Bai Letian." Wang Chongyang, the founder of the Complete Perfection Sect ( 全真派 Quanzhen Pai ), also wore such a hat. According to the Pervasive Mystery Collections of Gold and Jade ( 《洞玄金玉集》Dongxuan Jinyu Ji ), "Perfect Man Chongyang Who Saves with Mercy and Subtlety ( 重陽憫化妙行真人 Chongyang Minhua Miaoxing Zhenren ), then living in a hut on Kunlun Mountain, made a scarf with three and half feet of blue cloth with nine folds and nine beams on the top. He said he had seen this hat in dreams, named the Nine-Fold Huayang Scarf. The Master, looking dignified and alike to Immortal Zhongli ( 鍾離 Zhongli ), with this scarf adding to his grace, was a true transcendent." So Complete Perfection Daoists wore a Nine-Fold Scarf at first. But contemporary Complete Perfection Daoists wear the Scarf of Original Chaos ( 混元巾 Hunyuan Jin ), while Orthodox Oneness ( 正一 Zhengyi ) Daoists wear the Nine-Fold Scarf in rituals, in order to differentiate themselves from Complete Perfection Daoists. This product was added to our catalog on Thursday, February 04, 2010.